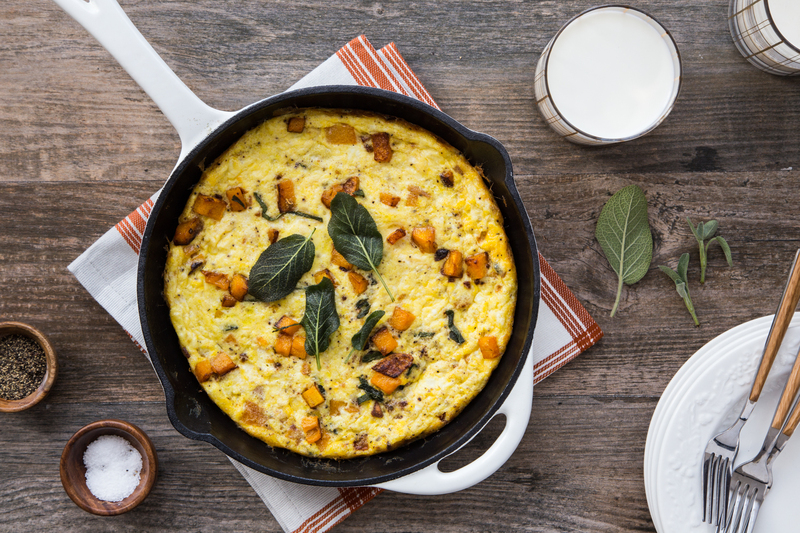 This post, Butternut Squash Sage Frittata, is sponsored on behalf of The National Milk Life Campaign. All opinions are, as always, my own. Thank you for supporting the brands and partners that I love and that help make Jelly Toast possible. I love cooking with the seasons. Just when my interest in a particular season’s offerings falters, the weather shifts and a new crop of produce and flavors is ready to be explored. It’s no secret that Fall, like so many other people, is my ultimate favorite season. It’s the start of the holiday season and therefore the season where I ensconce myself in plaid, flannel, and scarves and sip on apple cider, pumpkin lattes, and holiday blend coffee. If I can get my hands on a plaid flannel scarf, all the better. This is also the season where I bring home winter squash by the arm loads – the weirder the better! It seems that every year there are new varieties of squash for the taking. I recently saw one called Butterkin which looked basically like a tan pumpkin. So incredibly cute! 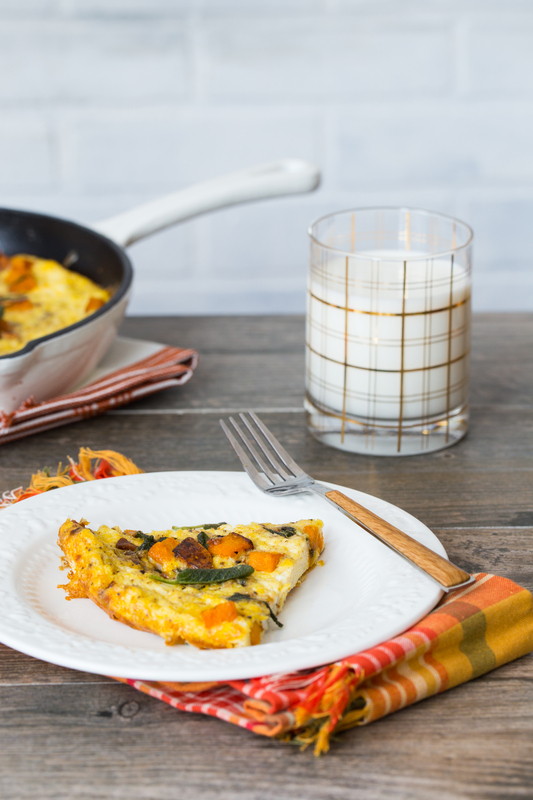 This all leads me to my newest version of serving winter squash at every meal: Butternut Squash Frittata. 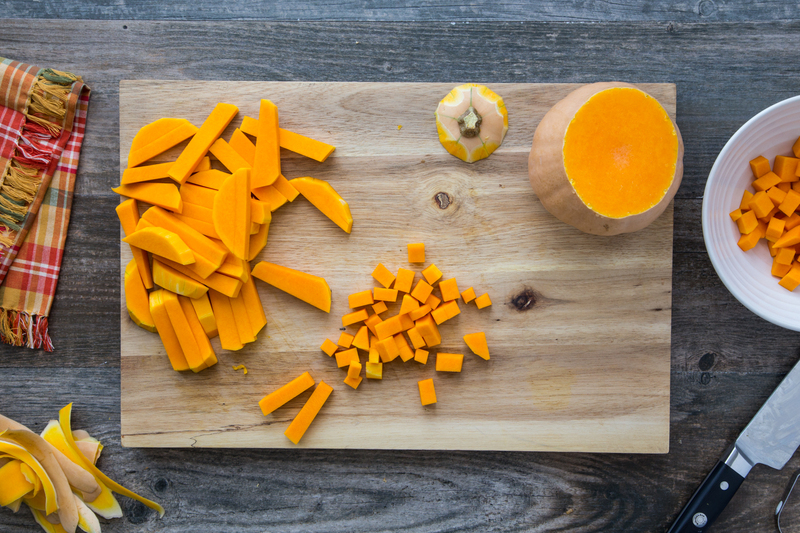 Butternut squash is ridiculously versatile and also easy to find, which is why I like using it to create recipes. It can be prepared sweet, savory, mashed, cubed, shredded or roasted. 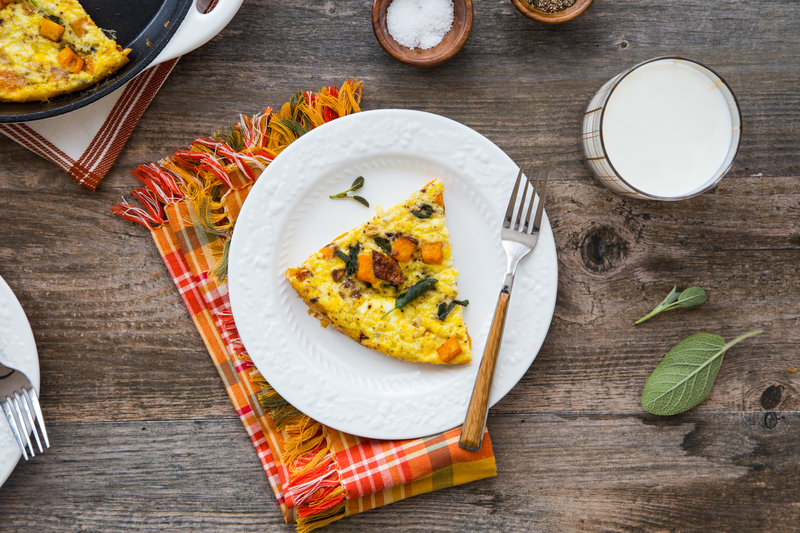 This weekend I took some simply cubed butternut squash and mixed it in to my classic frittata base to make this Autumn frittata full of squash and crispy sage leaves. If you have been around Jelly Toast for a while, then you know there is a special place in my heart for frittatas. If you are not familiar with a frittata, it’s simply a crust-less quiche or a large scrambled egg and milk casserole baked into a skillet. 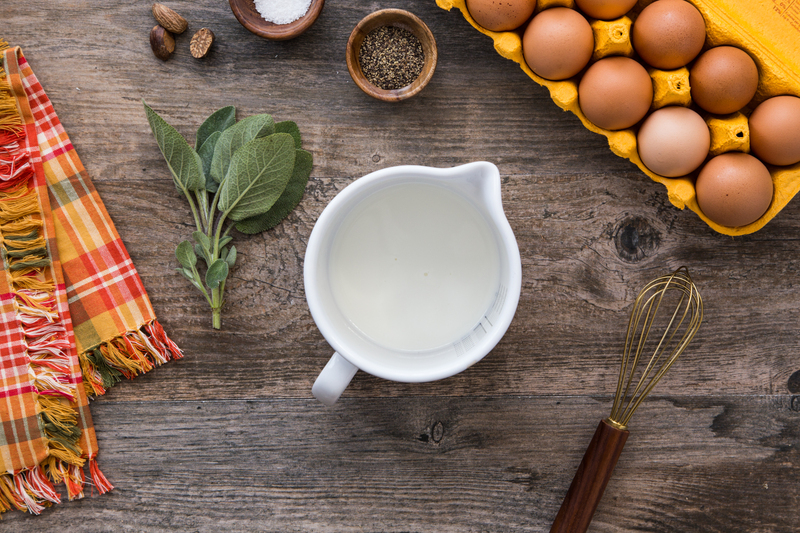 The base of my frittata rarely changes and consists of a few simple ingredients that I always have on hand: milk, eggs, salt, and pepper. 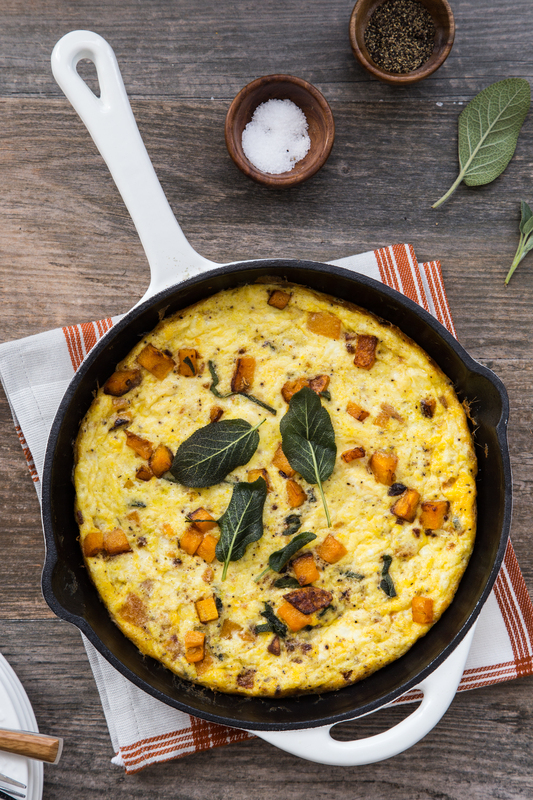 My Butternut Squash Sage Frittata is then mixed with caramelized butternut squash, garlic, and crispy sage leaves that surround you with the scents and flavors of the season. I realize that a Butternut squash can be an intimidating thing. It’s so hard and oddly shaped that it can be tricky to break down. 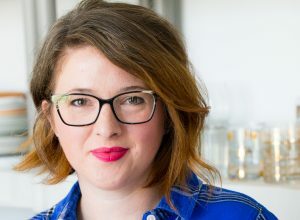 The way I like to cut a butternut squash is using a chefs knife to cut the round end off the long, skinny neck then peel with a vegetable peeler. Next, take the long section and break it down into slices, rotate and cut the slices into matchsticks before rotating again and cutting into a dice. The round end can be broken down in a similar way but first cut in half to remove the seeds. Then slicing it like a melon before dicing. 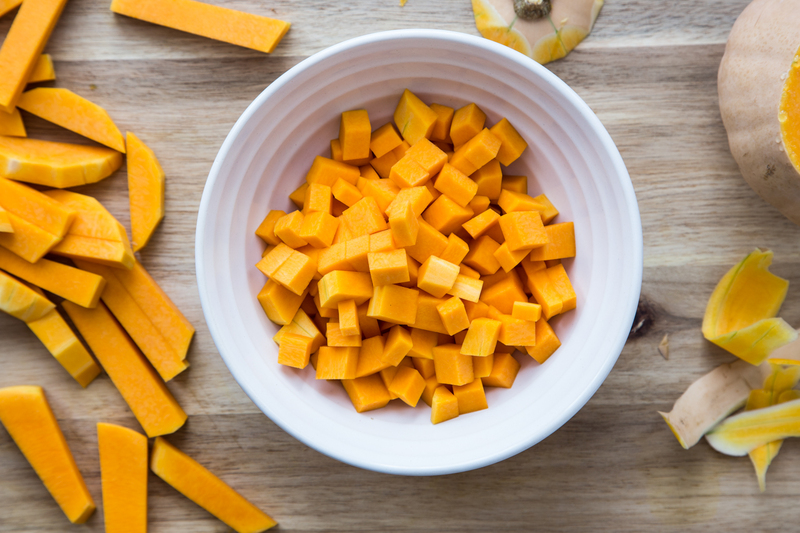 The chopping of the butternut squash can be done ahead of time and stored in the fridge for easy cooking the day of your frittata. 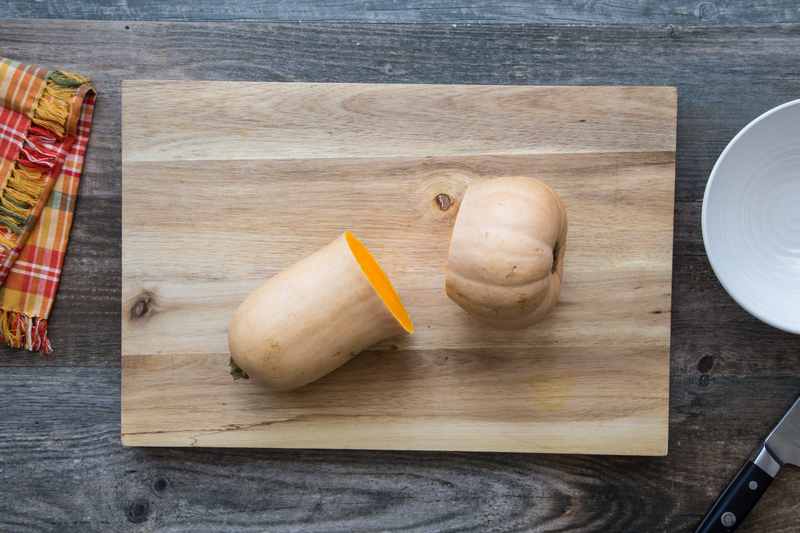 If breaking down a butternut squash is not your jam, look for pre-cubed butternut squash in your produce section. It’s a huge time saver! 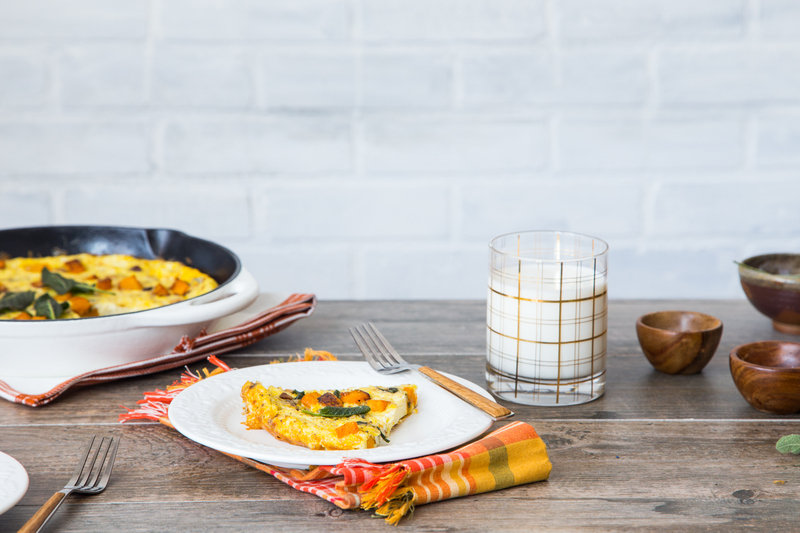 I always serve my family an 8-ounce glass of milk with breakfast which has 8 grams of high-quality protein, and when paired with my Butternut Squash Sage Frittata, it helps my whole family get to a protein-packed breakfast. Milk, with its high-quality protein, is wholesome and naturally nutrient rich. Plus, it’s widely available and an incredible value for high-quality protein and nutrients all year round. 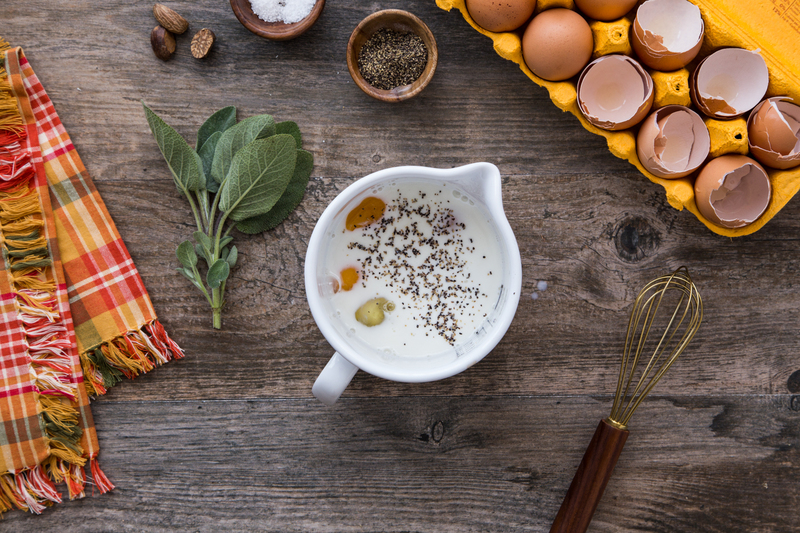 No matter what other flavors I’m playing with in my kitchen, milk both a versatile ingredient and a natural pairing. Heat olive oil in a small skillet until shimmering. Fry sage leaves in oil until crispy, about 5 seconds. Remove sage leaves from oil and drain on a paper towel. Sprinkle with salt while hot. Preheat oven to 425 degrees. Heat oil in a 10-inch cast iron skillet (or other oven-proof skillet), over medium high heat. 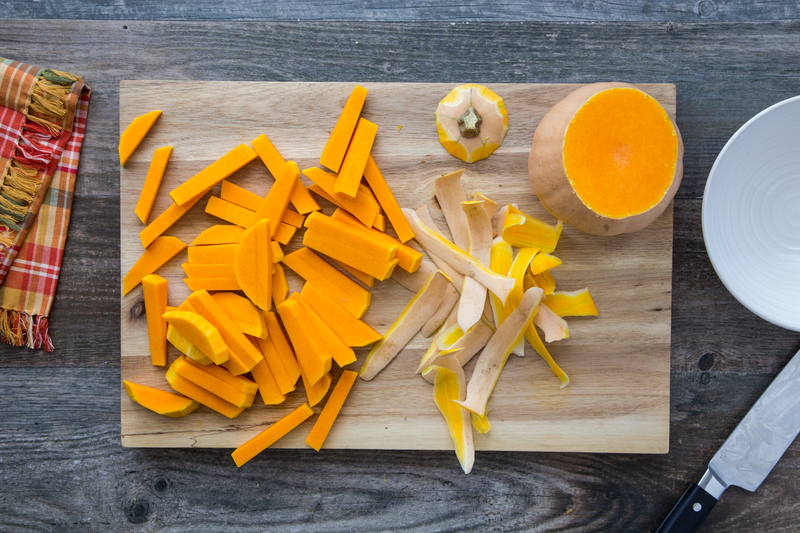 Add butternut squash, and stir to coat in oil. 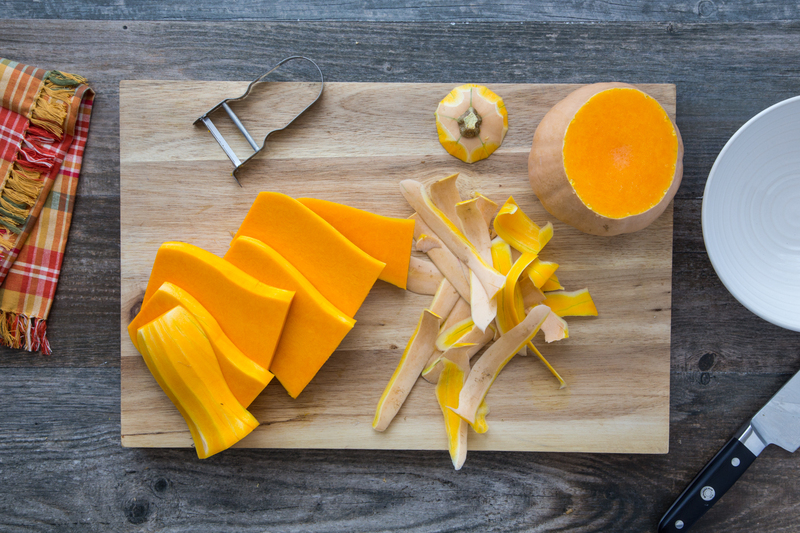 Spread butternut squash in a single layer and allow to cook for 2-3 minutes before stirring. Repeat this process until squash becomes tender and begins to caramelize in places, about 10 minutes total. Add garlic and chopped sage and stir until fragrant, about 60 seconds. 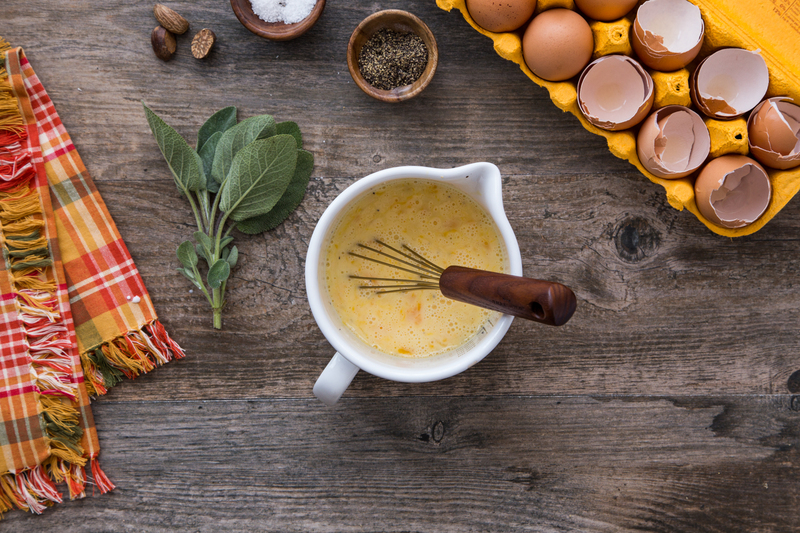 In a large bowl, whisk together eggs, 1/2 cup milk, pepper, salt and nutmeg. 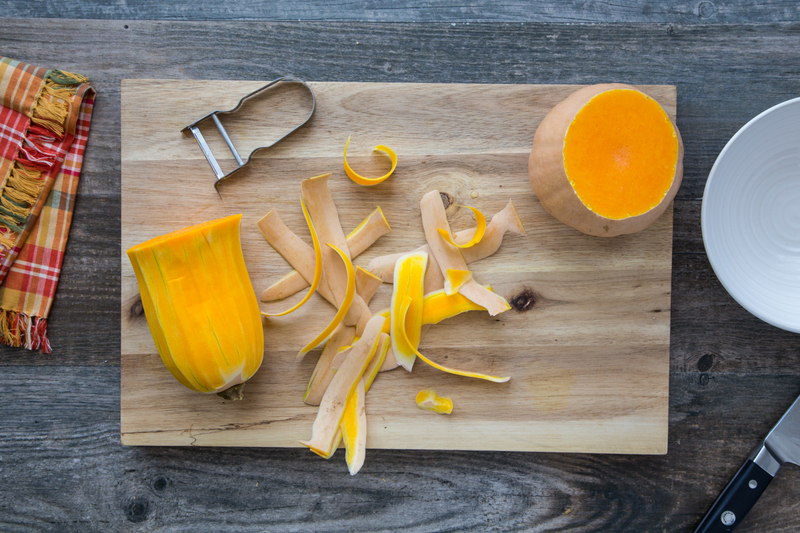 Pour mixture into skillet and stir gently for about 15 seconds to distribute squash evenly around the pan. Transfer skillet to oven and cook for 10 minutes or until egg is puffed and set. Remove from oven and let cool for about 3-5 minutes before cutting and serving with crispy sage leaves, as prepared per the above directions. Serve with remaining 8-ounce glass of milk. Thanks!! I think you guys would love this 🙂 I adore your new blog, VeggieTOT!!! This is my first time perusing your site; it looks good! I’m excited to try this recipe because not only do I love butternut squash, but sometimes finding a gluten-free pie crust for quiche is a pain (& expensive). This seems like the perfect answer to that little problem. Butternut squash and sage are so great together, aren’t they? I think the trick to the frittata is caramelizing the squash first to give it some texture 🙂 You can bet I’m heading over to check your butternut sage carbonara!! It sounds like something my family will love <3 Thanks so much for stopping by, Minna! !